THE HIGHLIGHTS SPRING & SUMMER 2019 CATALOGUE IS HERE! 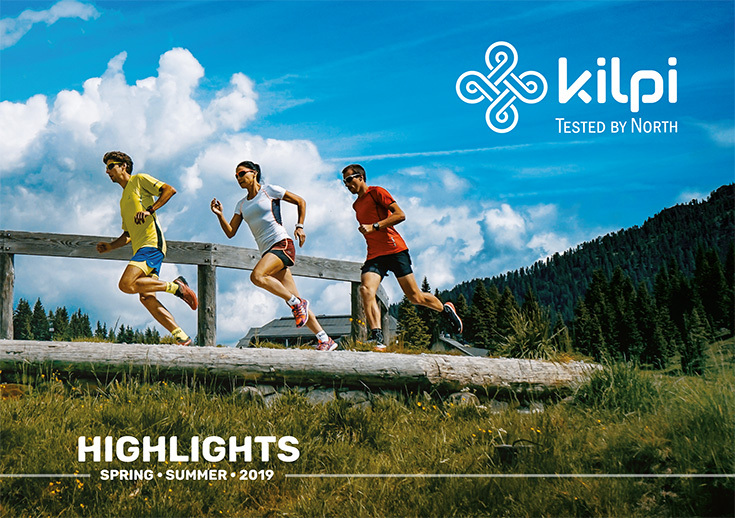 In the new summer collection for season 2019, you can look forward to a wide range of technical T-shirts that have been tested by our Kilpi Racing TEAM Ambassadors at the toughest outdoor races. We are launching a new ENYS softshell jacket, TOFANO and PAMIR outdoor vests and you can also look forward to the new HARDROCKrunning vest, developed for keen runners, which is to be launched at the beginning of June. For cyclists, we have prepared a wide selection of our team collection and matching bike wear sets in Kilpi colors. As we care about your safety, our bike products feature a number of high visibility reflective elements. We have designed new trendy INVERA ¾ leggings and ROSLYN long leggings for women. Their soft and strong material ensures utmost comfort and maximum functionality, making them perfect for every trip and tour. Women will surely appreciate our new RINTA, sports bra, which we are planning to introduce to you. We are going to gradually introduce all our novelties to you through our regular newsletters, here on our blog and on our website www.shopkilpi.cz/en. We believe the new collection will enchant you in the same way it has enchanted us. You can get your HIGHLIGHTS catalogue in Kilpi Stores. You can also browse its electronic form here or download it here (67 MB).